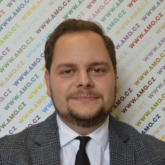 He has been associated with AMO since 2018 and is currently responsible for media and public relations of AMO, organisational support and logistics of public and expert events as well as the office management. He holds a Master’s degree in Contemporary History at the Faculty of Arts, University of West Bohemia in Pilsen and also spent a semester at the Italian Università per Stranieri di Perugia. For the last two years, he was dealing with project management and the organisation of various kind of events. During his work for an American technology company, he was supporting several international sales teams. Recently he finished an expert study program at the European Academy of Diplomacy and the internship at the European Affairs Communication Department at the Office of the Government of the Czech Republic. He is highly interested in the field of Security and EU Defense strategies, the V4 countries and the history of European diplomacy.